Paper Daisy Crafting: Would you like a full set of 10 Stampin' Up! ink pads (worth £63) for FREE??? Would you like a full set of 10 Stampin' Up! ink pads (worth £63) for FREE??? Dropping in here very quickly today with some exciting news. Stampin' Up! have just announced a very special offer for anyone signing up to become a Stampin' Up! demo during July. 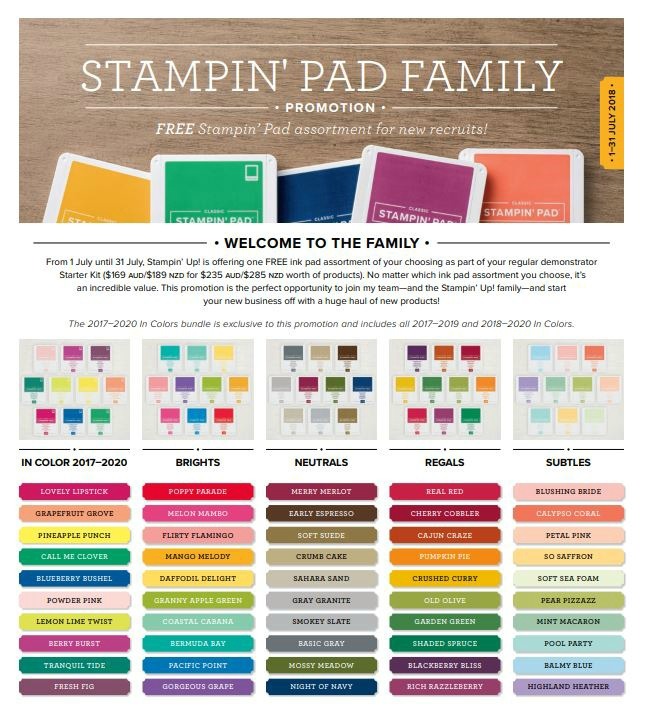 As well as the usual offer - which is always a fantastic offer - of £130 worth of your personal choice of products for only £99, if you sign up during July you can also choose a full colour family set of stamp pads. That's 10 stamp pads absolutely free. I wish I could sign up again! Which ink pad family will you choose? There are so many gorgeous new colours - the subtle or brights are my new favourites, but the regals are lovely too and the neutrals are perfect to coordinate with almost any other colour. 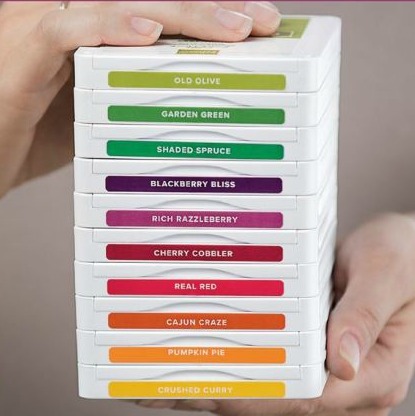 If you find it too difficult to choose just one, you could add a colour family of ink pads to your kit and then choose another one for FREE? This really is one of the best promotions I've ever seen Stampin' Up! offer. As I said above the Starter Kit is £99 and includes your choice of any £130 of products (plus the ink pad assortment) with free shipping . If you decide to sign up with me, you will be a member of my Paper Daisy Crafters team. We are a small but growing team, and you will also benefit from being a member of a wider team under my upline. As a team member you will meet loads of like minded people, enjoy being part of a craft community and be invited to take part in exclusive crafting events. I've said it before, but joining Stampin' Up! really was one of the best decisions I've ever made. And that is only the start. Once you join you get till the end of December to reach your first quarterly minimum of 300CSV (which equates to £275 sales which include your own purchases). You will be able to pre-order from the new Autumn/Winter Seasonal catalogue in August before the launch to customers in September. As an introduction, I will post out a welcome pack and introduce you to the team. You will receive a quarterly magazine from Stampin’ Up! filled with ideas, inspiration and business ideas. You will be given password access to the demo website to place your own orders and earn 20% discount on every order you place. So why not get making that starter kit list now so that you're ready to go on July 1st? You can choose £130 worth of any goods (but not a penny more) so get out your calculator and get working on the best deal to get you started.There is no commitment and no penalty if you decide that being a Demonstrator isn’t for you – so why not give it a try. I would love to welcome you to my team and Stampin’ Up! There is more information shared in the Join my team button at the top of this page. If you have questions please get in touch as I am here to help and lets have a chat to see if this is the right opportunity for you?